A video of this talk was recorded at Øredev in Malmö, Sweden in November 2012. You may have heard of Go. It's my favorite language. I think you'll like it, too. As of September 2012 we have more than 300 contributors. Go is Object Oriented, but not in the usual way. The result: simple pieces connected by small interfaces. Go provides CSP-like concurrency primitives. The result: comprehensible concurrent code. 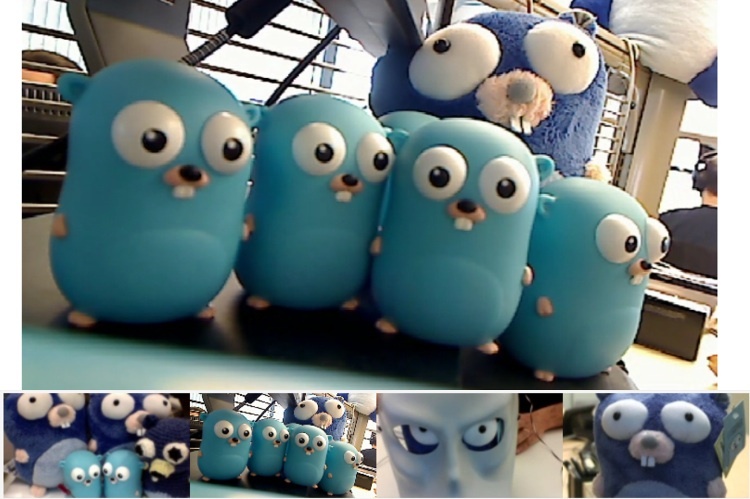 Go is about composition, concurrency, and gophers. Hey neato! We just used Fprintln to write to a net connection. That's because a Fprintln writes to an io.Writer, and net.Conn is an io.Writer. // copied and the first error encountered while copying, if any. Goroutines are lightweight threads that are managed by the Go runtime. To run a function in a new goroutine, just put "go" before the function call. In this talk we'll look at a simple program, based on the popular "chat roulette" site. everything one user types is sent to the other. The chat program is similar to the echo program. With echo, we copy a connection's incoming data back to the same connection. For chat, we must copy the incoming data from one user's connection to another's. Copying the data is easy. As in real life, the hard part is matching one partner with another. Goroutines communicate via channels. A channel is a typed conduit that may be synchronous (unbuffered) or asynchronous (buffered). A select statement is like a switch, but it selects over channel operations (and chooses exactly one of them). The match function simultaneously tries to send and receive a connection on a channel. 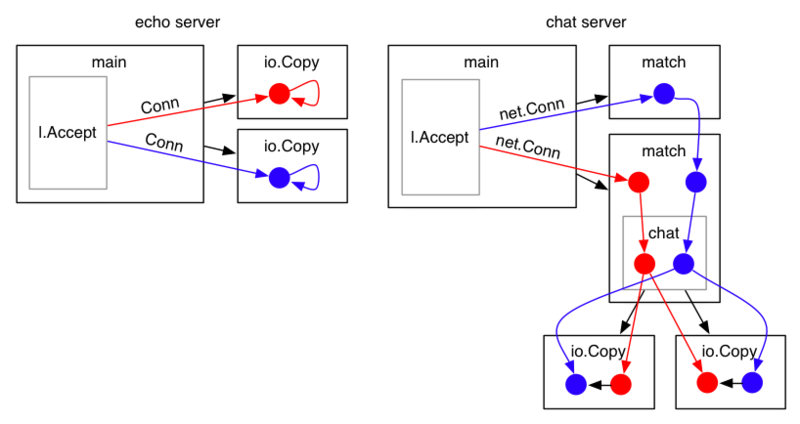 If the send succeeds, the connection has been handed off to another goroutine, so the function exits and the goroutine shuts down. If the receive succeeds, a connection has been received from another goroutine. The current goroutine then has two connections, so it starts a chat session between them. The chat function sends a greeting to each connection and then copies data from one to the other, and vice versa. Notice that it launches another goroutine so that the copy operations may happen concurrently. It's important to clean up when the conversation is over. To do this we send the error value from each io.Copy call to a channel, log any non-nil errors, and close both connections. "Cute program," you say, "But who wants to chat over a raw TCP connection?" Good point. Let's modernize it by turning it a web application. Instead of TCP sockets, we'll use websockets. We can't just use a websocket.Conn instead of the net.Conn, because a websocket.Conn is held open by its handler function. Here we use a channel to keep the handler running until the socket's Close method is called. Go supports a kind of "mix-in" functionality with a feature known as "struct embedding". The embedding struct delegates calls to the embedded type's methods. By embedding the *websocket.Conn as an io.ReadWriter, we can drop the explicit socket Read and Write methods. What if you connect, but there's noone there? Wouldn't it be nice if we could synthesize a chat partner? Generated sentences beginning with the prefix "I am"
"I am a free man!" "I am not a number! I am not a number! I am a free man!" "I am not a number! I am not a number! I am not a number! I am a free man!" We'll use a version that has been modified to be safe for concurrent use. // Chain contains a map ("chain") of prefixes to a list of suffixes. // A prefix is a string of prefixLen words joined with spaces. // A suffix is a single word. A prefix can have multiple suffixes. // Write parses the bytes into prefixes and suffixes that are stored in Chain. // Generate returns a string of at most n words generated from Chain. We will use all text that enters the system to build the markov chains. and feed all incoming data to the Chain instance. // each incoming write with a generated sentence. The bot should jump in if a real partner doesn't join. To do this, we add a case to the select that triggers after 5 seconds, starting a chat between the user's socket and a bot. The chat function remains untouched.